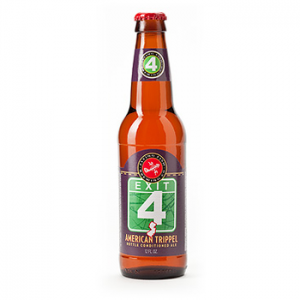 Exit 4 American Trippel is a complex effort that pours with a clear golden color and a good amount of white head that laces itself down the glass. The beer has a small amount of sweet and malt that can be discerned from its nose, while the first sip links together grain, malt, bananas, and figs before a stronger alcohol burn sneaks its way in. The Exit 4 is well-balanced and holds up to reaching room temperature well with a small shift in the overall flavors present. The grain elements fade into the periphery as the citrus and Belgian candi sugar flavors increase; Exit 4’s drinkability increases considerably through the intricate web of tastes that reach one’s tongue; while one may only need one or two bottles to complete a night, the beer stays interesting through the whole night. Flying Fish has kept the sweeter elements balanced with the inclusion of a decent hop body, ensuring that Exit 4 stands heads and shoulders above the average tripel on the market. The tetralogy of hops (Amarillo, Palisades, Columbus, and Simcoe) provide a refreshing end to each sip, granting a fresh palette to all that tip back a bottle. The bitterness of the hops fade a little bit when one gets to the end of a bottle, but the boost that their inclusion gives to the fruity side of the beer is consistent from beginning to end. Exit 4 is a perfect sipping brew, but would stand up well to stews, strongly-flavored cuisine, and sharp cheeses. Flying Fish’s Abbey Dubbel is one of the style’s highlights. Make sure to visit the Flying Fish Brewery’s website for considerable information about the brewery’s efforts, news, and a full complement of information regarding the types, availability, and the geographical area in which one can purchase Flying Fish beers.